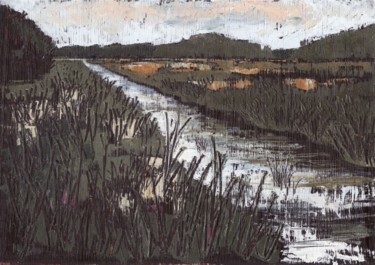 This landscape painting shows a river in the greater Gearagh area near Macroom in County Cork. The Gearagh is one of the largest alluvial forests in Europe and is still dotted with many narrow channels of slow moving waters like this, when the river level is low. This place is a haven in every respect and is a wonderful place to walk at any time of year, given that the wilderness is a refuge for all types of wildlife. The price quoted is for the framed piece. The artwork is currently framed in a vintage ochre-coloured ornate frame. A set of limited edition prints, signed and stamped by the artist, is available; email the artist (see contact details in Biography) for full details.